This is another marker in Danville’s Green Hill Cemetery. 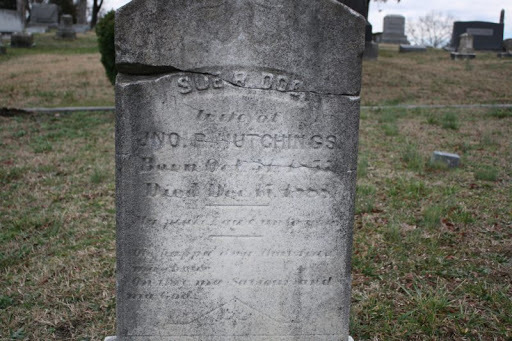 I regret not having a better photo of Sue Hutchings’ tombstone so that I could transcribe the verse underneath her information. Susan Ritchie Doe was born between 1857-1859 (the different reports list different years) to Thomas B. Doe (of New Hampshire) and Sarah Ross Doe (of Virginia) in Pittsylvania County, Virginia. One of her uncles was Judge Charles Doe of the United States Supreme Court, suggesting that she came from a family which probably had some prominent standing in the community. While searching for information about Sue’s early life, I came across a letter written by her uncle Charles while he was visiting Thomas’ family. In that letter, which was written before Susan was born, a slave visiting one of Thomas’ servants falls ill and dies and Charles makes observations about the funeral and some of the traditions of slave funerals. Sue married Capt. John Richard Hutchings in or around 1880 and at that time the couple was living with her parents. 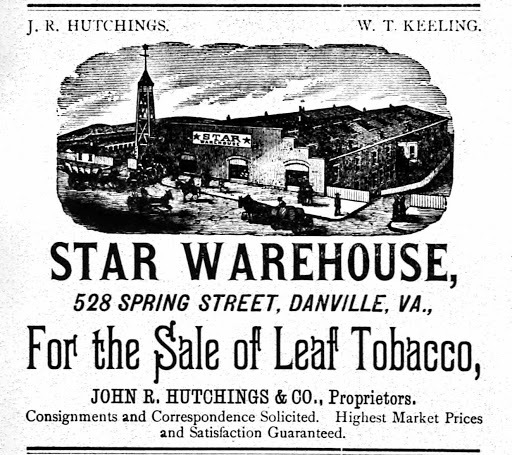 In the 1881 Danville City Directory John, a tobacconist, is listed as the head of J.R. Hutchings & Company in association with the Star Warehouse. Their first child, Lucy Allen, was born in 1881 and their second child, Susie D., in 1886. Sue was pregnant at least one other time in 1888. The wording on the above burial record troubles me because the reader can’t be sure if it indicates that Sue developed septicemia from having an abortion or if she developed the infection from a spontaneous abortion. Either way, it was a tragedy for someone to die so young of an infection that could’ve been prevented or treated today with the advances in medicine, sterilization and hygiene.